Calpipe Calbrite™ 1.9-Inch Wide type UNY explosionproof union with MNPT connection, has a trade size of 3/4-Inch and 0.635-Inch thread length. This 2.7-Inch union has 316 stainless steel construction with bright finish for high strength and corrosion resistance. It is suitable for food and beverage production, marine and coastal facilities, chemical plants, water and wastewater treatment, pharmaceuticals and cosmetics, refining and extraction sites, petrochemical operations, pulp and paper mills along with other corrosive environments. 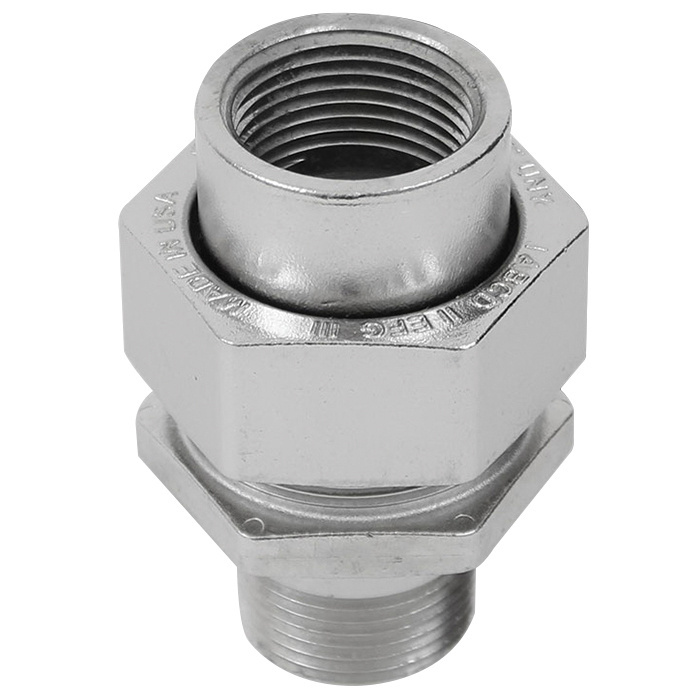 It is perfect for use with stainless steel threaded conduit. The union meets cULus, UL 1203, UL File No. E465422, CSA C22.2, Use in Class I Division 1 Groups A, B, C & D, Class II Division 1, Groups E, F and G and Class III standards.